Brainwright is a recent discovery of mine, but so far I've been quite impressed with some of their puzzles. I only have a couple of them and another few that were later "adopted" by them, like the Rudenko's Disc or the Roundominoes. 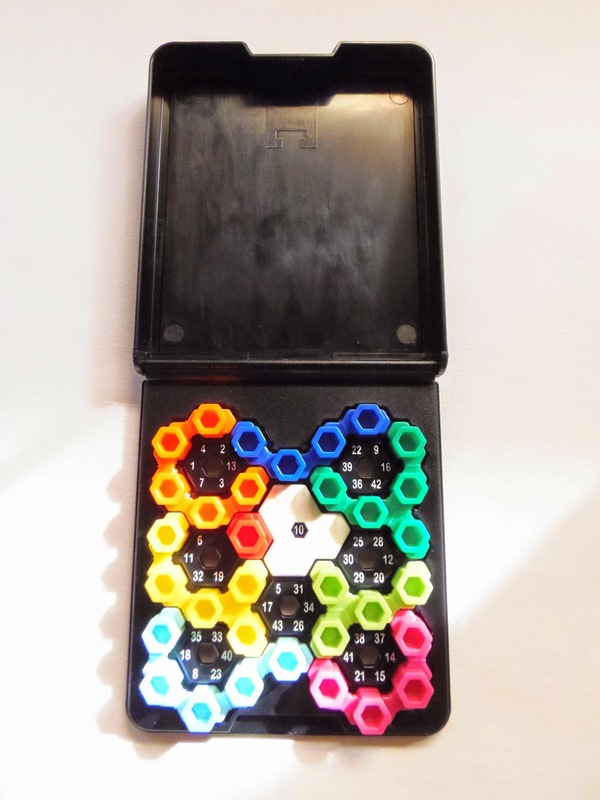 The one you see above is called Hexus and it's a logic game for one player with 44 challenges. 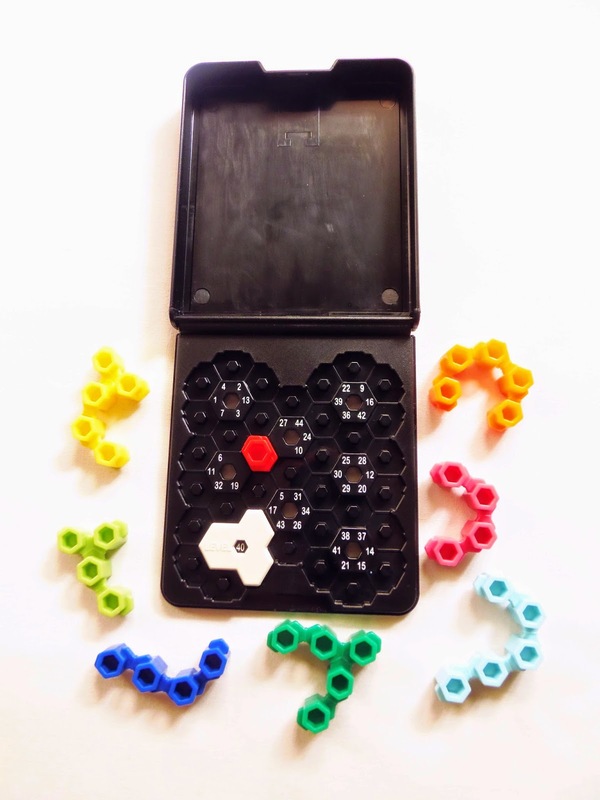 The name Hexus comes from the shape of the pieces, each in a different arrangement of hexagons that are linked together. 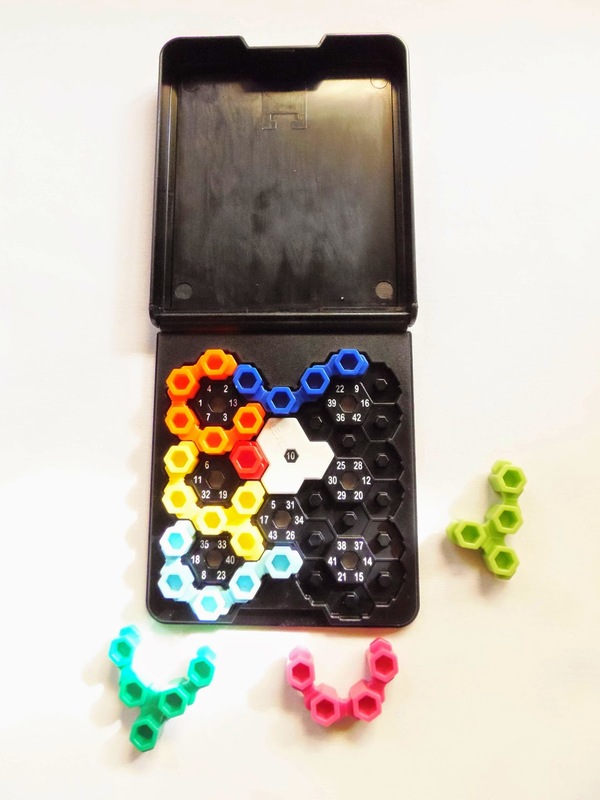 The seven pieces are all distinct and they can be rearranged in many different ways inside the honeycomb-shaped tray, which is itself a collection of eight hexagons adjacent to each other. Besides the seven colored pieces, you can also see inside the tray a single red piece (can not be moved) and an odd-shaped white piece. This white piece is very important, because it shows the current challenge number marked on the tray, and no piece can be overlapping it. To get started, all you need to do is choose a position for the white piece and place the first pieces correspondent to that particular challenge. You can see the starting position for all 44 challenges on the back of a pamphlet provided with the game. There's no solutions included, so you're on your own. 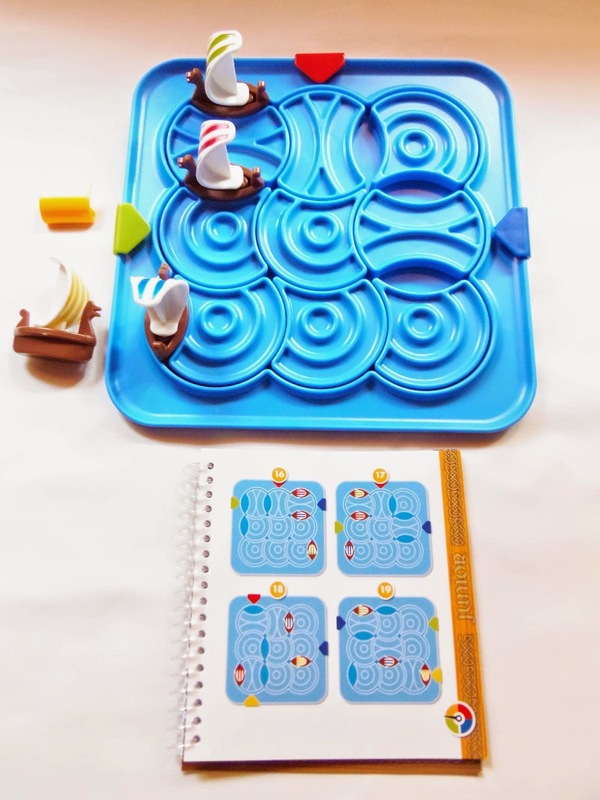 Fortunately for you, the game starts off pretty easy, as the first few challenges only require a couple of pieces to be placed on the board, since the rest are already in their correct positions. As you progress, though, fewer and fewer pieces will be put in the board at the beginning, until you reach the final levels where you have to fit all the pieces with no help. You can flip the pieces on both sides, so you'll have more possibilities to fit them. I didn't find the game very difficult, even on the last challenges. Yes, these final ones are more challenging, but with only seven pieces and a tray with a fixed shape, there's only so much you can do. To make it more interesting and more difficult, you can start every challenge from scratch instead of placing the initial pieces - Just the white one. I did find it very fun to play with and quite enjoyable, because of the unusual shape of the tray and the pieces. The pocket size allows you to carry it anywhere with you. 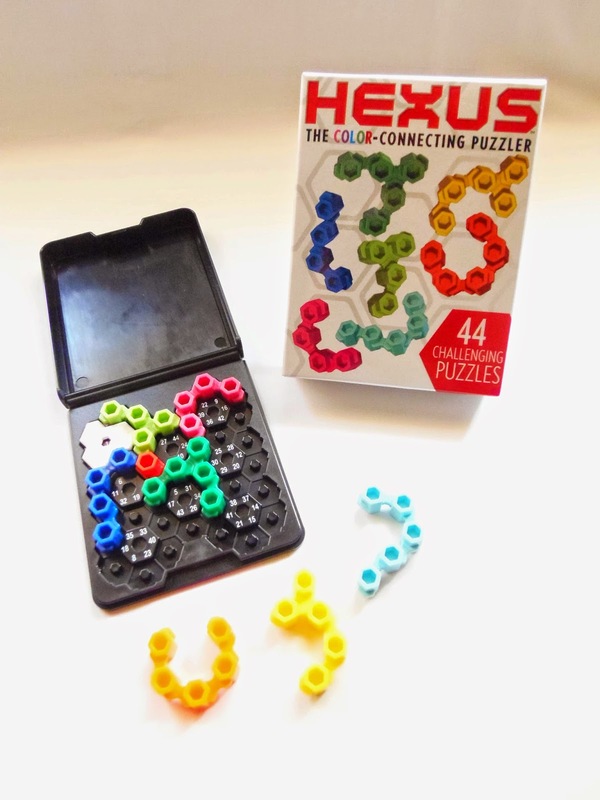 Availability: The Hexus game is available at PuzzleMaster for $18.99 CAD. Check out the other Brainwright puzzles and games here. Philos, a German wooden puzzle manufacturer, makes pretty interesting packing puzzles. Most look very simple in design and concept, but they can still offer a great deal of challenge. One of these such puzzles is called the Tribar Puzzle, and it's deceptively harder than you'd think at first. The puzzle is nicely built with quality materials, not plywood. There's a nice contrast between the dark-shaded frame and the lighter pieces. On the bottom of the frame you can see a black sheet of something velvety - it gives a nicer finish, even though it's on the bottom - probably also to give it some friction and prevent it from moving much against a flat and smooth surface. 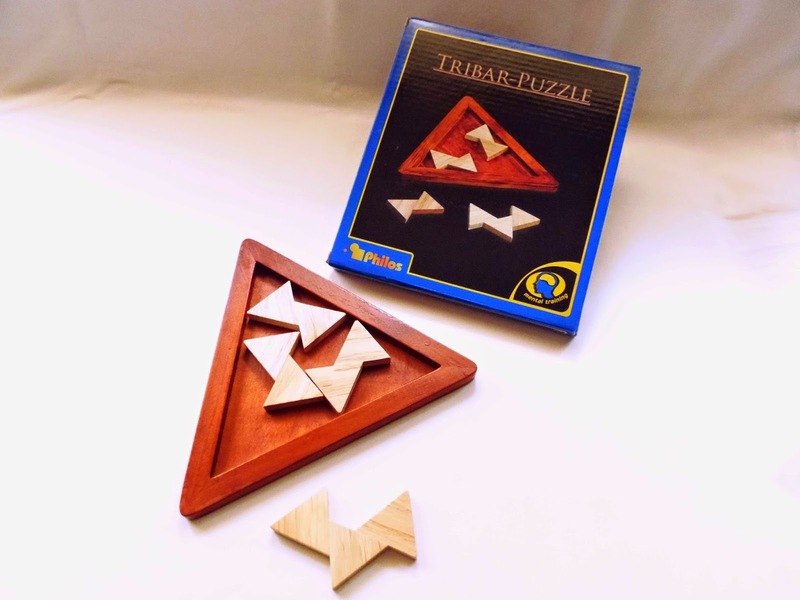 The Tribar Puzzle consists only of four odd-shaped pieces. There are three identical pieces, but all of them are made by gluing equilateral triangles half off-center from one of their edges. The frame is perfectly triangular, also equilateral, and the goal is to pack all four pieces inside. There's only one way to do it, excluding rotations or mirror images. You can rotate or flip the pieces in any direction you want, though. Rated as a level 2/4 by the manufacturer and 7/10 by PuzzleMaster, I'd say that the rating is mostly accurate. 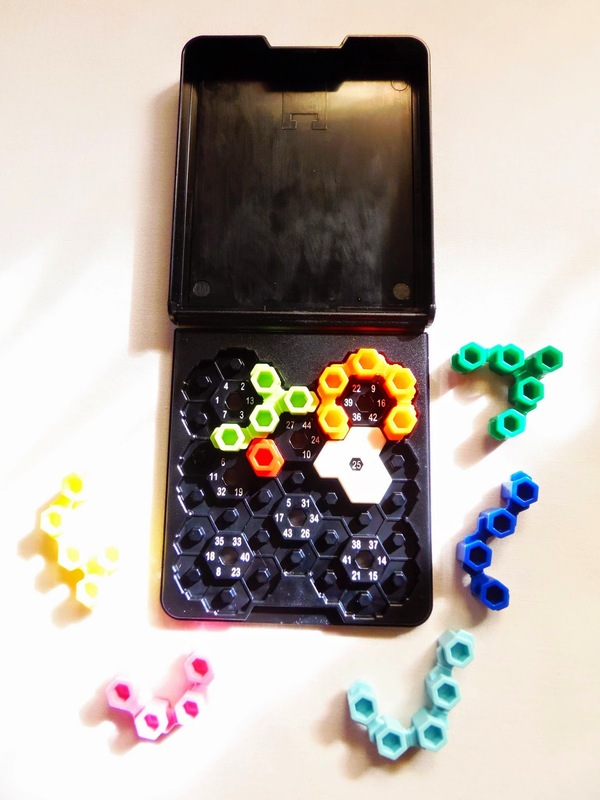 The puzzle is a little challenging, especially because of the Z-shaped pieces, but with only four pieces to move around there's only so much you can do with them. It took me about 10 minutes to find the solution, so I'd say with just a little patience it's perfectly possible for anyone to solve it eventually through some trial and error. The solution is not symmetric, but makes a neat shape (not chaotic). 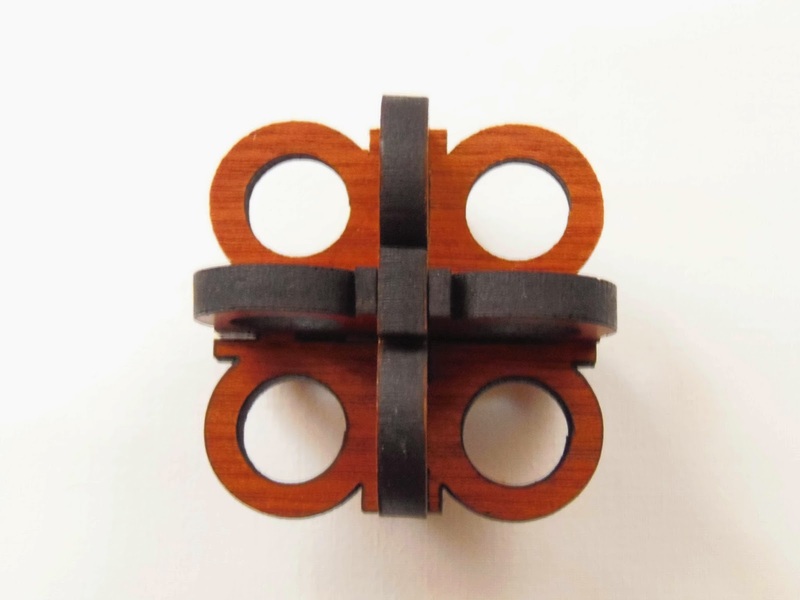 The Tribar Puzzle is a simple but pleasant puzzle. 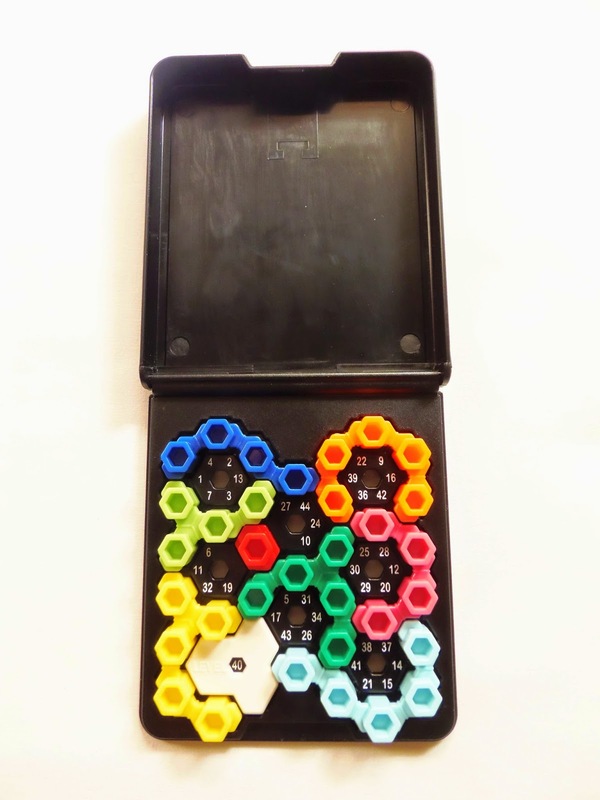 It's not frustrating to solve, and packing puzzle fans will thoroughly enjoy it. Philos has a lot of puzzles like this, so you only need to choose the one that most appeals to you...or get them all. 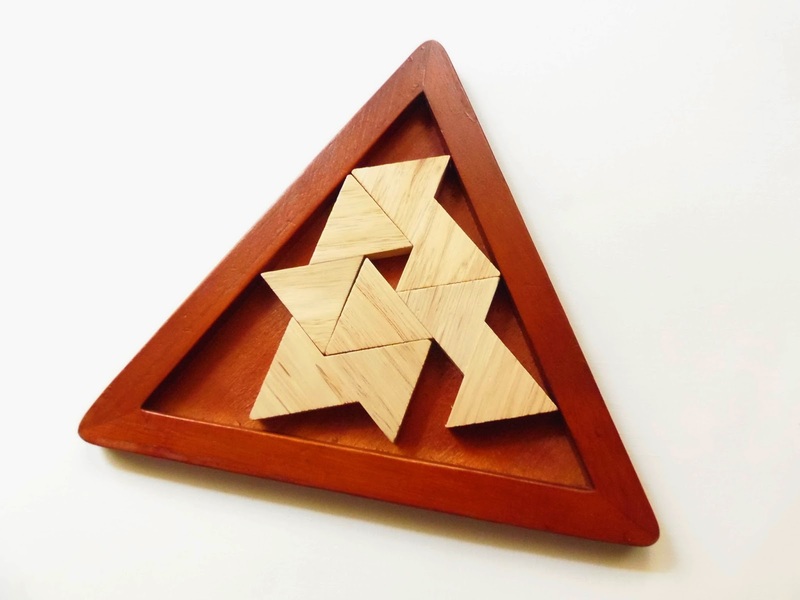 Availability: The Tribar Puzzle is available from PuzzleMaster for just $10 CAD. 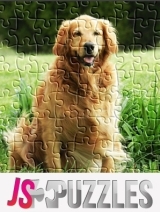 To check other puzzles from the same manufacturer, click here. 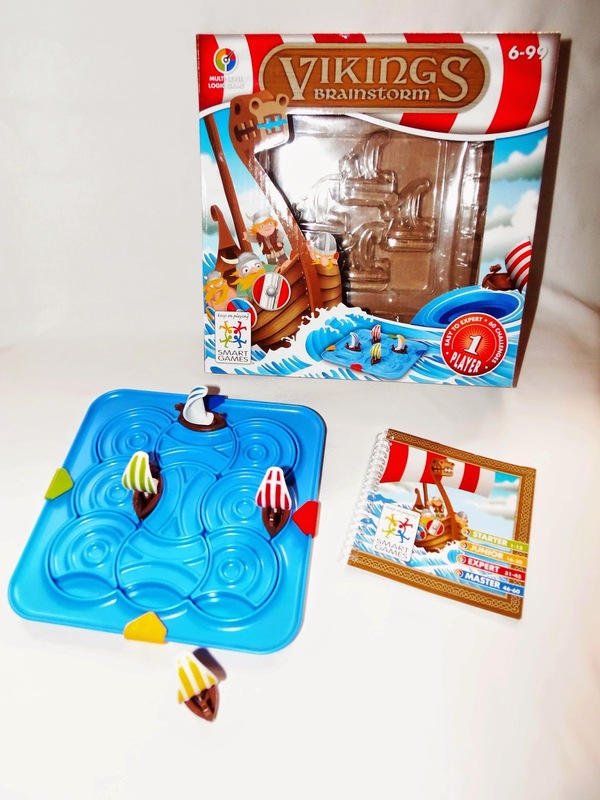 Help the Vikings escape the seastorm and return the ships to their corresponding port - This is the premise of the Vikings logic game, designed by Raf Peeters and produced by SmartGames. 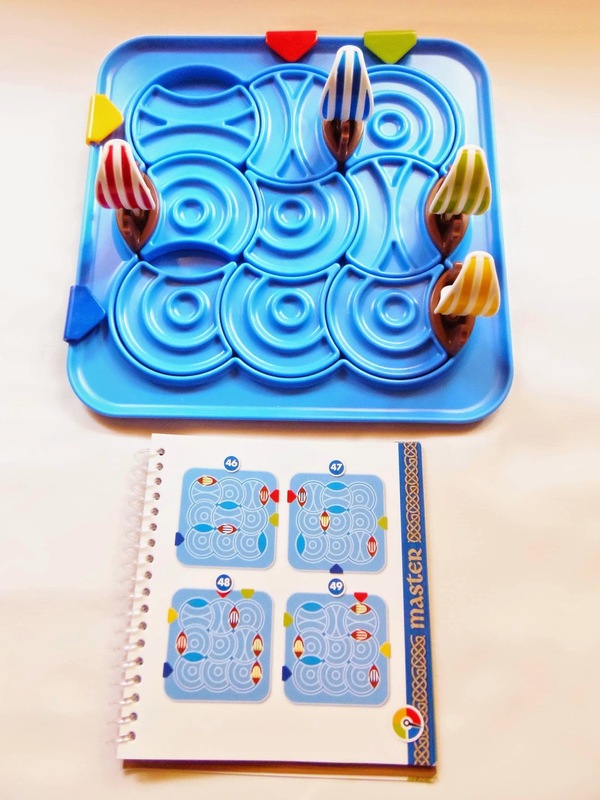 Simple to understand and quite addicting, this challenging game will put you right at the middle of a brainstorm. Vikings is a very cool sliding puzzle game, although a bit different from what you're used to see in a regular sliding puzzle. The concept consists of nine sliding pieces that can rotate 360º on their own axis. The reality, however, is that it's not so easy to move the pieces, because their movements are usually blocked by the position of other pieces that overlap their path. It's up to you to find the best way to unblock each ship's path to their corresponding spot, next to the arrow of the same color. The design of the game is gorgeous. From the beautifully made ships, each with its sails in a different color and the characteristic Viking dragon-shaped prow, to the shape of the pieces representing whirlpools, everything was well thought-out and nicely presented by Raf. 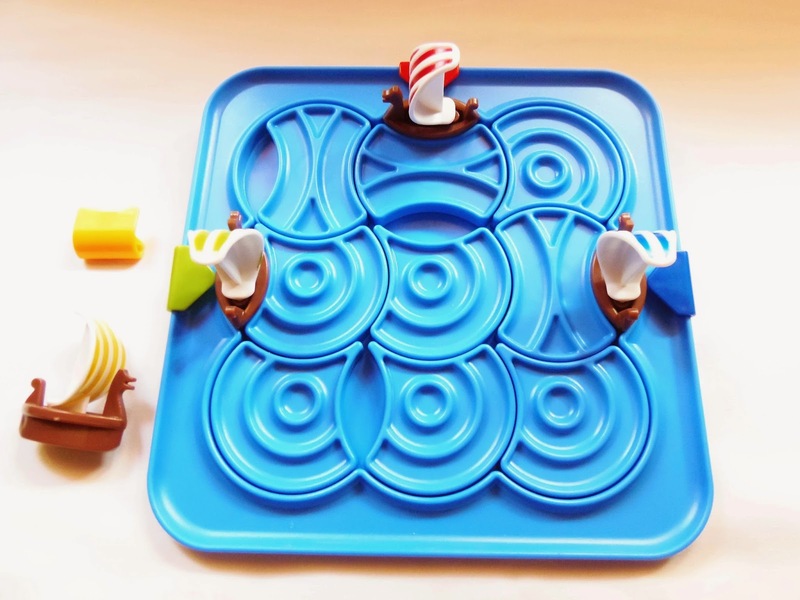 There are a few rules to keep in mind in order to play Vikings: you can only move the pieces of the board that have a ship next to it; you can't lift any boats or pieces from the board when you're solving a challenge - the only allowed move is sliding; the pieces only move in 90º increments, otherwise it will block any possible moves. These rules are very quick and easy to understand, so you can jump to the challenges right away. 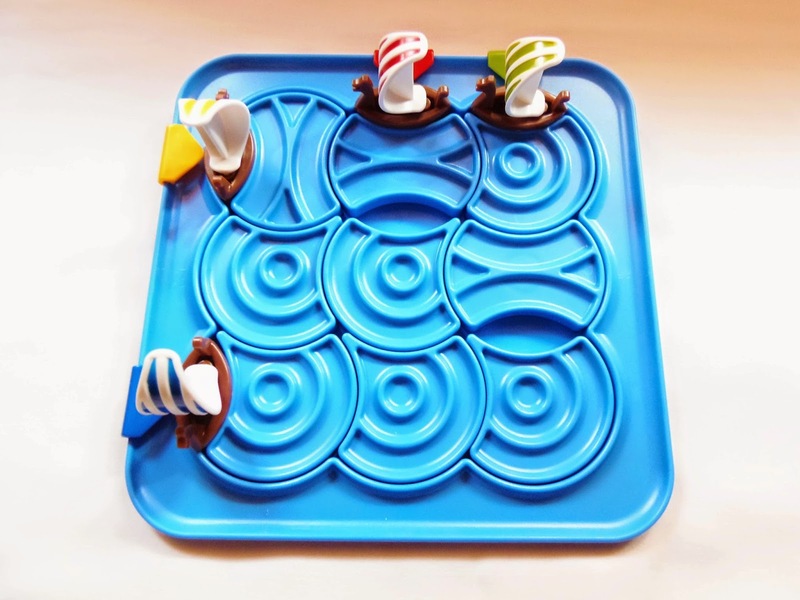 This time, instead of five difficult levels, there are only four. Nevertheless, don't underestimate the game, because this is actually one of the hardest games from SmartGames. Even the "Starter" level is somewhat challenging at first, and the more you progress the more steps are required to solve a challenge. You'll find yourself many times going back and forth with your ships trying to get them to their port, only to find a blocked piece ahead of your path. Often, you'll only make progress by taking two steps back and one forward. This peculiar strategy is a necessary evil for the game, but that's also what makes it so fascinating, and so different from all the other games I've played so far. It shouldn't be a surprise by now that I'm always pleasantly satisfied and impressed by Raf's designs. His games are designed to keep us engaged and maintain our brains healthy, and having fun at the same time. Vikings is a difficult game, but worth every minute you're playing with it. Availability: The Vikings game is available at any Amazon, as well as many others from SmartGames. Siebenstein-Spiele is mostly known for their beautiful and colorful packing puzzles, but that doesn't mean that's all they do. 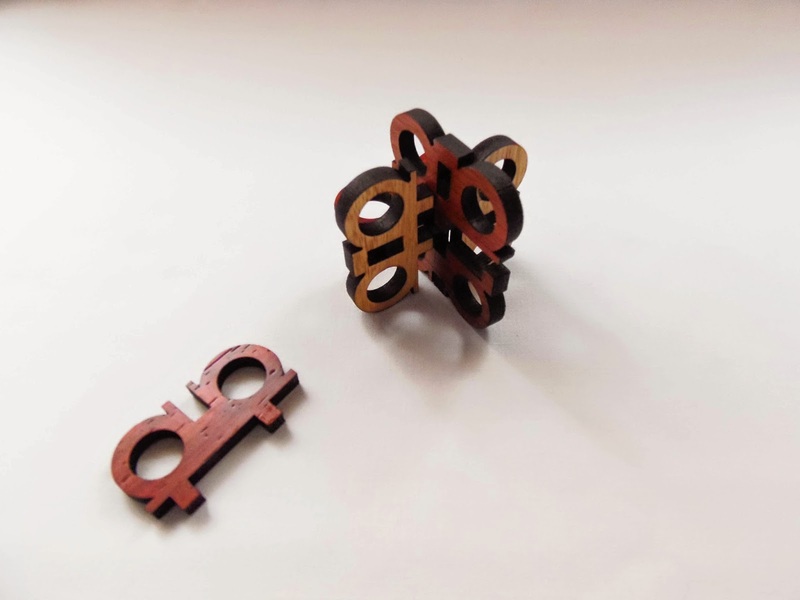 A nice and interesting interlocking puzzle, Six Pieces of Eight demonstrates the ability of designer Jürgen Reiche to make any type of puzzle he puts his heart into. When I first saw this puzzle I was very impressed with its design, which is quite uncommon to see in interlocking puzzles. 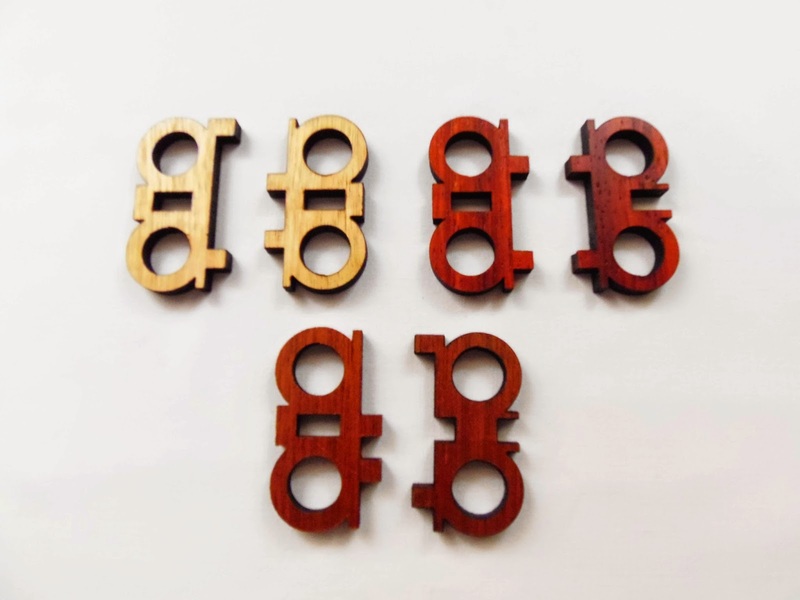 Usually, the designs in this category are made with solid pieces of wood, but Jürgen decided to make a bolder design with holes in all six pieces that resemble the shape of an eight. The size is a bit small to my taste for a puzzle like this (5.5cm (2.2") in diameter), but I understand why it had to be this way. 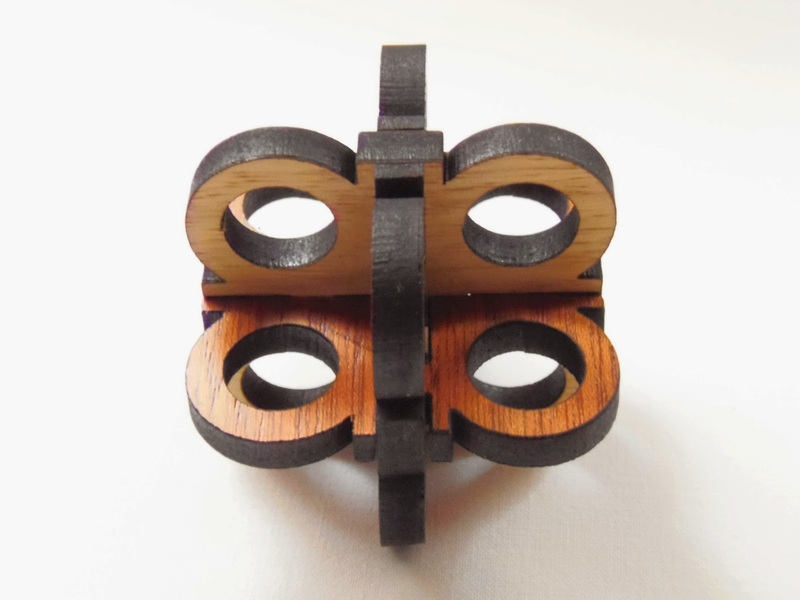 The reason has to be because of the material chosen to make the puzzle, which is laser-cut wood. In my opinion, this wasn't a very good idea, because it's a very fragile material, especially given the fact that you will apply some force to the pieces and you could very easily break one. It's different with packing puzzles, though, because there's no need to apply any kind of force on them, but with interlocking puzzles...It's just a bad choice. Forgetting for a moment the materials, let's focus on the puzzle itself. Comprised by six pieces, as the name suggests, the first goal of the puzzle is to take it apart, one piece at a time. This is moderately difficult, perhaps a level 7/10, but the real challenge is to put it back together. Here, the difficulty level is rated as an 8/10, and I completely agree - it's rather tough to find the right way to reassemble it, but it could've been worse. 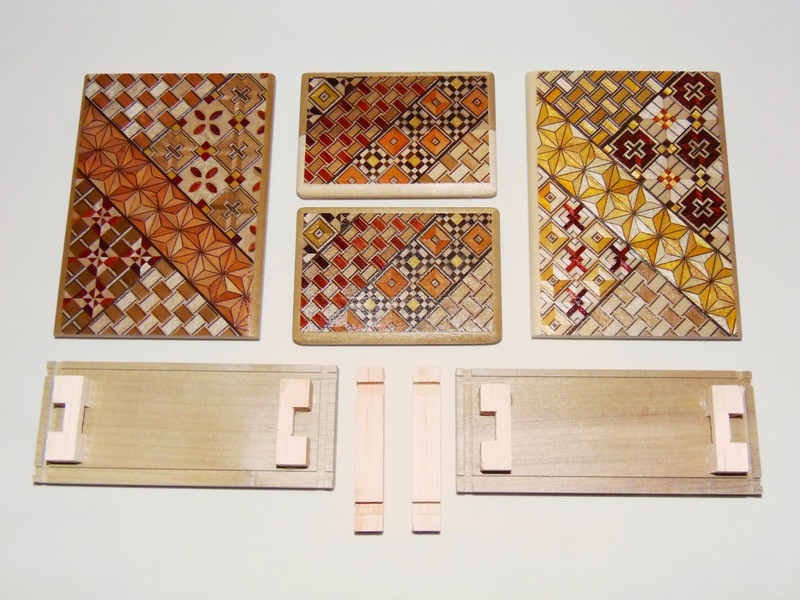 The reason lies in the colors used for the puzzle, as the pieces are separated in three pairs, each with a different color, which facilitates the reassembly process. Had the pieces all been made in one single color it would've been even harder to get it back to its original position. Even so, I had to cheat a little and photograph the puzzle in its half-disassembled state to check how the pieces were interacting with each other. It was still difficult this way, so this is definitely not a puzzle for beginners. Solution: If you need help with the solution, you can download it here. I was somewhat disappointed on the overall quality of the puzzle. 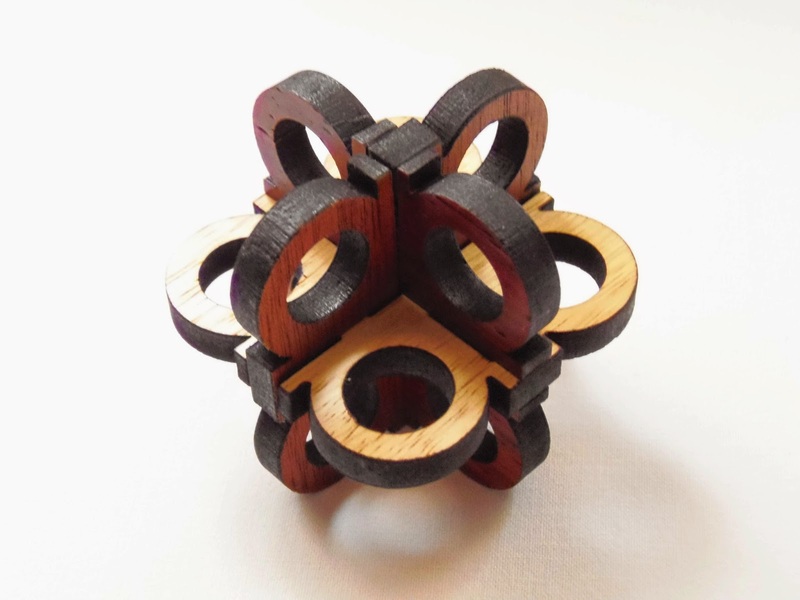 For an interlocking puzzle, it's not recommended to use laser-cut wood, but if you're willing to overlook this fact, it's still a great and challenging puzzle. Availability: I got the Six Pieces of Eight from PuzzleMaster, where you can also find lots of other great puzzles by Siebenstein-Spiele. Falling ever more in love with Japanese Puzzle Boxes, this Christmas I couldn't resist and had to order a few ones to add to my rapidly growing - albeit still small - puzzle box collection. I love all kinds of puzzle boxes and trick boxes, ever since I started my puzzle collection, but the Japanese ones have a certain "je ne sais quoi" about them that truly fascinate me. At first, when I began to notice the beauty of Japanese Puzzle Boxes, they all seemed very similar to each other with no particular differences, beyond the size and number of steps. The traditional Yosegi pattern is the most recognizable feature in these boxes and if you're not paying too much attention to them, that's all you gonna see...until you give them the attention they deserve. There are so many different kinds of Japanese Puzzle Boxes I wouldn't know where to begin in order to describe them all, so I'll just stick to the ones I actually got. 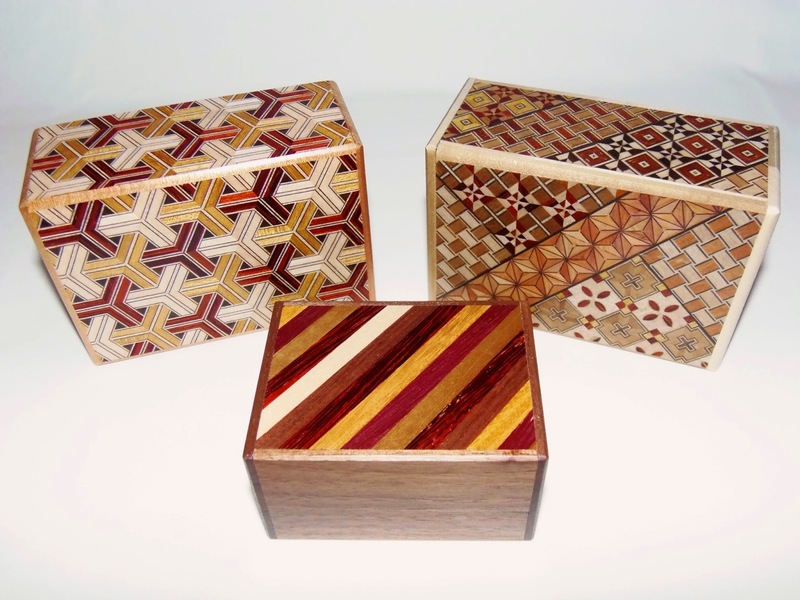 These three hand-crafted boxes are so different from the traditional Yosegi puzzle boxes that they defy the definition of what really makes a true Japanese Puzzle Box. Is it the mechanism? The pattern? The Materials? The people that make them? Because each of these three boxes don't have all four requirements at the same time. Let's start with the 4 Sun 12 Steps Kikkou puzzle box. This is a gorgeous design, made with a not so common pattern, called Kikkou. The name means tortoise-shell in Japanese, because the hexagon-like pattern is reminiscent of a tortoise shell. The design you see is in fact a derivation of the original Kikkou pattern, known as Bishamon Kikkou, because it's seen on Bishamonten's armor, a Buddhist deity. Being a 4 Sun puzzle box, this means that the size is 12cm in length, with 8cm wide and 5.5cm in height (4.72" x 3.15" x 2.17"). It's a great size that lets you see the real beauty of the Kikkou pattern all over the box. This is also another major difference from the well-known Yosegi pattern, since you can see several different geometric design within the same pattern all over the box. The Kikkou pattern has this M.C. Escher feel to it, kind of like a 3D image with different textures represented by the three wood colors. 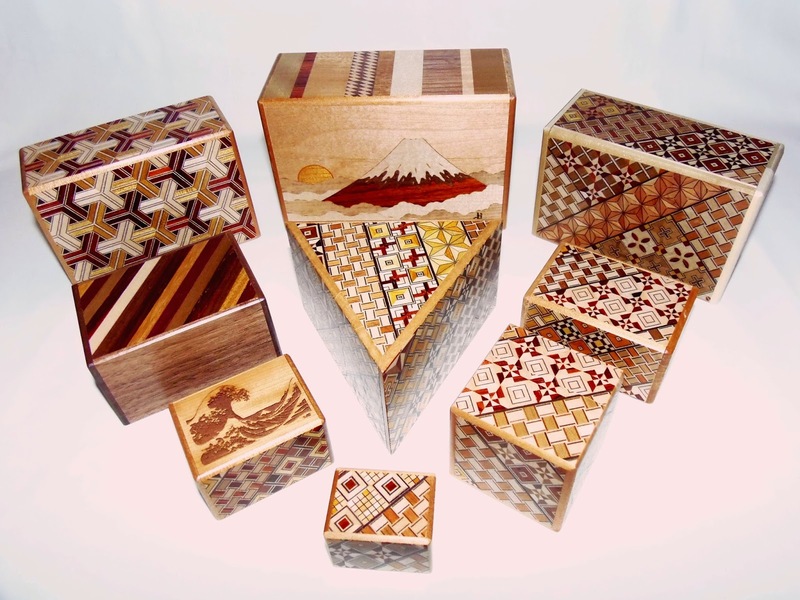 Mind you, none of the patterns you see in Japanese Puzzle Boxes are painted. 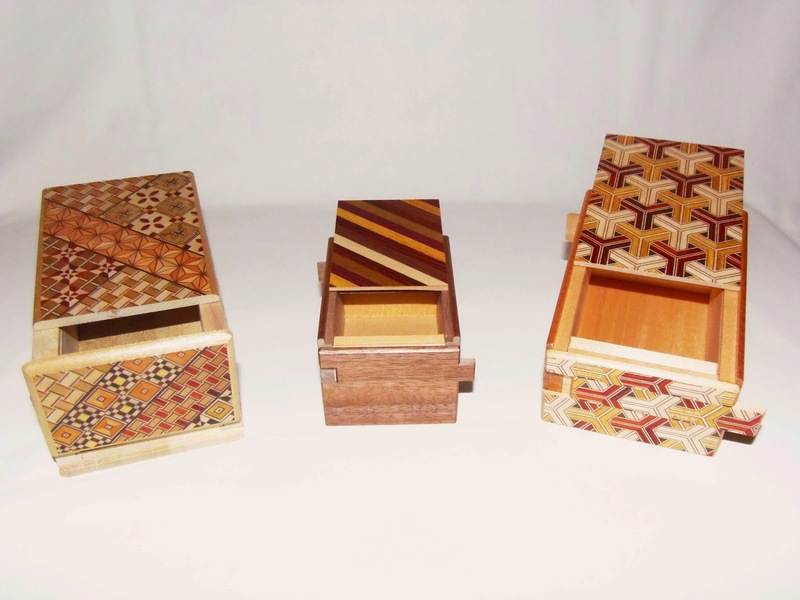 They're made using a marquetry technique called Zougan, resulting in thin sheets of wood that is later applied as a finish to the box. The Kikkou puzzle box can be opened in 12 steps, so it's moderately easy to open, at least if you're used to this type of mechanism. The first attempt can be somewhat tricky, in order to figure out the correct sequence of moves, since the top needs to move back and forth a couple of times, but with a bit of trial and error it's fairly easy to open. Closing the puzzle boxes is usually easier than opening, and this one is no different. The second puzzle box is a bit different in terms of materials used. It's a 3 Sun 12 Steps Natural Wood - Stripes B. 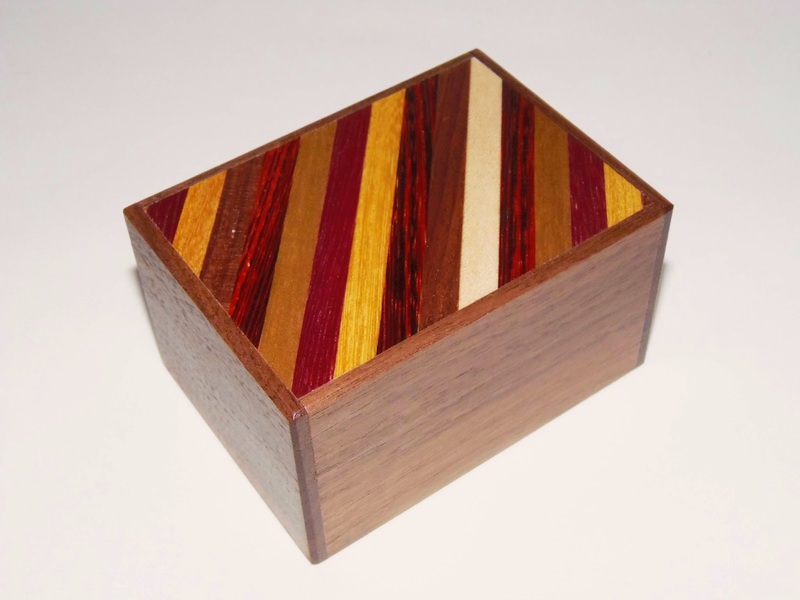 As the name suggests, instead of the usual lighter colored wood used in most Japanese Puzzle Boxes, this one uses natural wood, in a much darker shade. Also, the usual pattern is absent and in its place you can see a beautiful combination of alternating six colored diagonal stripes on the top and bottom made from exotic Japanese woods. The stripe pattern indicated is B, as there's another one with horizontal stripes. At the time I got it, both versions were available, but I preferred this one over the Stripes A for its bolder design. This box is a little smaller than the 4 Sun Kikkou, as it's a 3 Sun, measuring 9cm x 7cm x 5cm (3.5" x 2.75" x 2"), but just as beautiful as its bigger counterpart. The 12 steps required to open it are more or less identical to the 4 Sun box, but the difficulty is a little higher in the Natural Wood version, since the sliding panels are completely hidden in the single color sides of the box, as opposed to the easier to spot panels, seen by the offset pattern on the Kikkou version. And last, but not least important, the 4 Sun 4 Steps Kumiki puzzle box. This is yet another completely different puzzle box from the ones we usually see on puzzle stores. At first sight, it looks like any other ordinary Yosegi puzzle box, but when you solve it you're in for a surprise, as the mechanism is a little different from the usual sliding side panels. It's the same size as the Kikkou box, but the steps required to open the lid are just four, although they're a little different from the traditional mechanism. 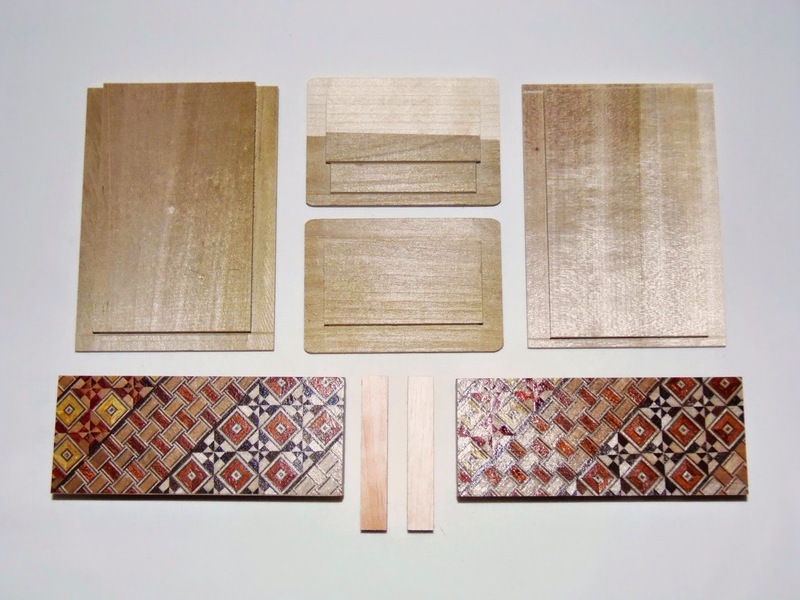 Kumiki is the Japanese word for "joining wood together", and there's a whole type of interlocking puzzles dedicated to this craft. 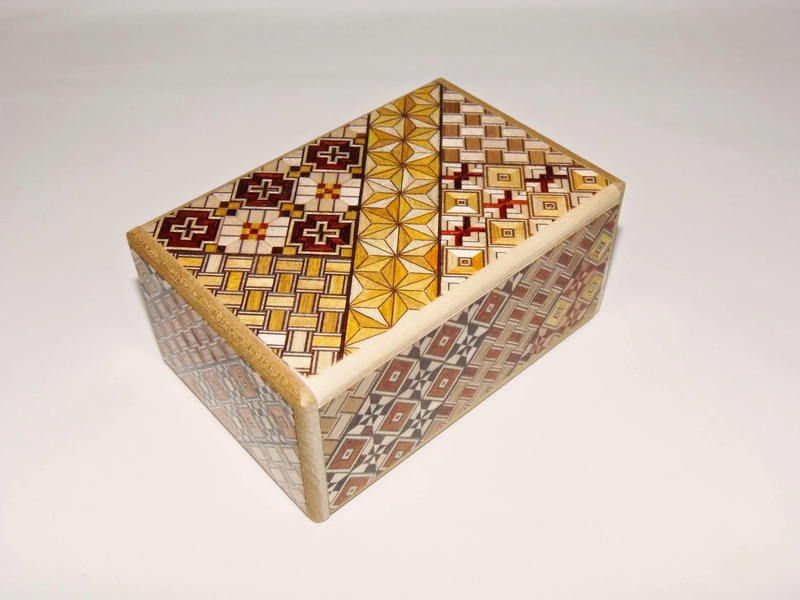 What it means for this unusual Japanese Puzzle Box is the way it's solved, since every side of the box can be taken apart into eight pieces and put back together again. There's essentially a two-part solving process: the first part is similar to any traditional puzzle box, with the exception there's no sliding panels on the sides - the sides themselves are slidable; after you open the top lid and slide it all the way off, you can actually remove the rest of the box's sides, which in itself is an impressive feature. 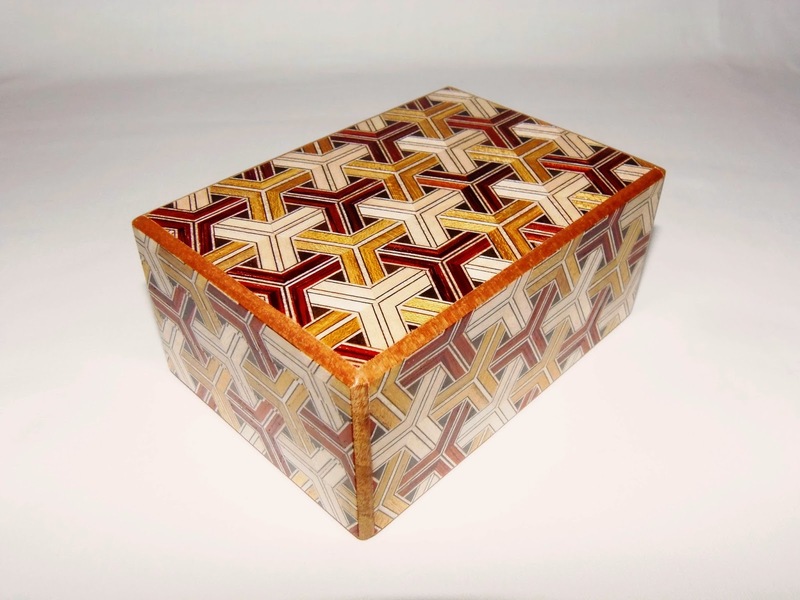 The design of the box is decorated with the beautiful Yosegi pattern, but again, the texture of the box is completely different from what you'd expect: it's rougher to the touch, letting you know that the technique used is different from the usual Zougan. It seems that every single tiny piece of wood used to create the Yosegi pattern was meticulously put in place, one at a time, which is even more impressive; it has a shinier surface, as if a coat of glaze had been applied, and the wood is also different, though I can't be sure what its type is. And yes, one of the sides is actually a lot shinier than the other, as lighter colors were used. Availability: At the time of writing, only the Kikkou box is available to buy from Japan Craft UK. The other two are no longer available, but it doesn't mean they won't be again. Just check the site often and you might be lucky. It was the first time I ordered from this site, but I was very impressed with the quality of service, the competitive prices and the wide range of puzzle boxes and other related Japanese goodies. And if you're in Europe, that means no customs taxes, which is quite a big incentive. New year, new Constantin puzzles. I can't get enough of these cute little packing puzzles. This little devil is called Ghostbuster, and if you're not afraid of ghosts then you should be afraid of these ones, as it's quite challenging to pack them all inside the frame. 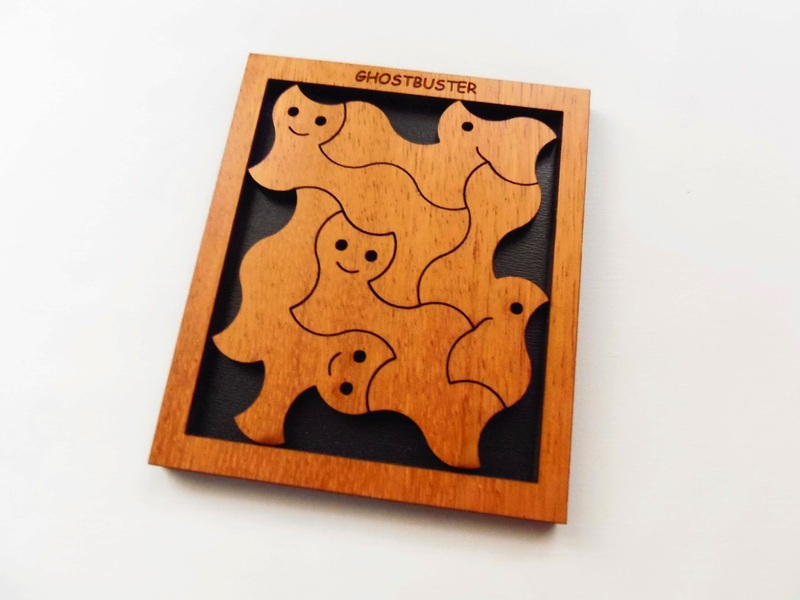 Ghostbuster is made from laser-cut wood (plywood), and the design is quite intriguing, featuring five ghostly-shaped figures with unusual contours. Unlike some of the more well-known Constantin puzzles, where many types of woods are used to create a colored palette, this one has only one plain color, which is a shame, considering the level of quality and presentation the designer has accustomed us in many previous occasions. Nevertheless, the design is still quite interesting and unique. This packing puzzle is a little different from what you might be used to. The pieces don't occupy the entire area of the frame, but when solved no holes can be seen within the perimeter occupied by the pieces - only on the edges of the frame. 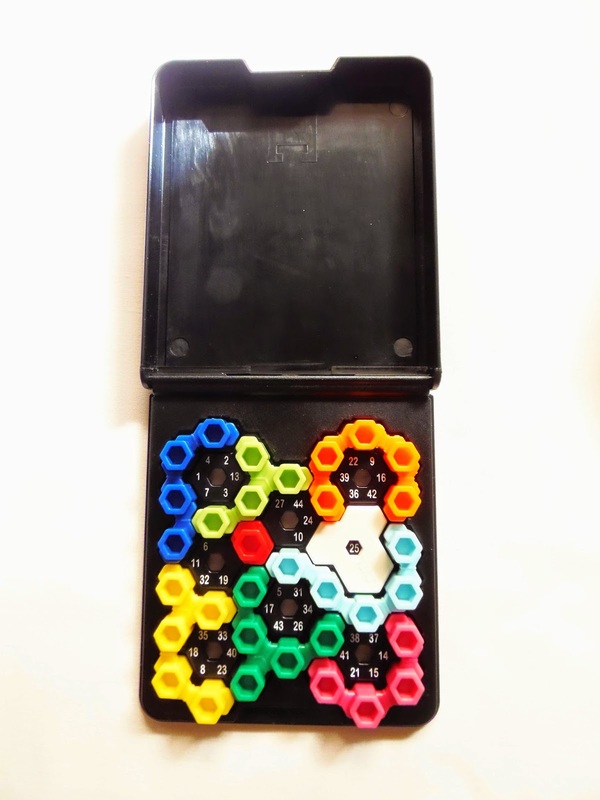 This type of puzzle can be easily compared to the Picture Frame Puzzles, where you have to make the most out of the area you're given and try to fit all the pieces inside, even if at first sight it looks impossible. Rated as a difficulty level 8/10, you can expect some challenging moments as you try to solve it. The pieces can only be used on one side, since the other side doesn't have the details engraved on it. This will only make things more difficult than they already were, given the odd shape of the pieces. Of the five ghosts, only two are identical twins - not that it matters much for the overall difficulty of the puzzle. Not counting rotations, I believe there's only one solution for the Ghostbuster - a very difficult solution. Ghostbuster by Jean Claude Constantin is surely a nice puzzle, but presentation-wise it could've been better. He raised the bar for incredibly beautiful puzzles, so it's only natural to ask for the best when it comes to one of his designs. Availability: You can get a copy of the Ghostbuster puzzle at PuzzleMaster for $18.99 CAD. 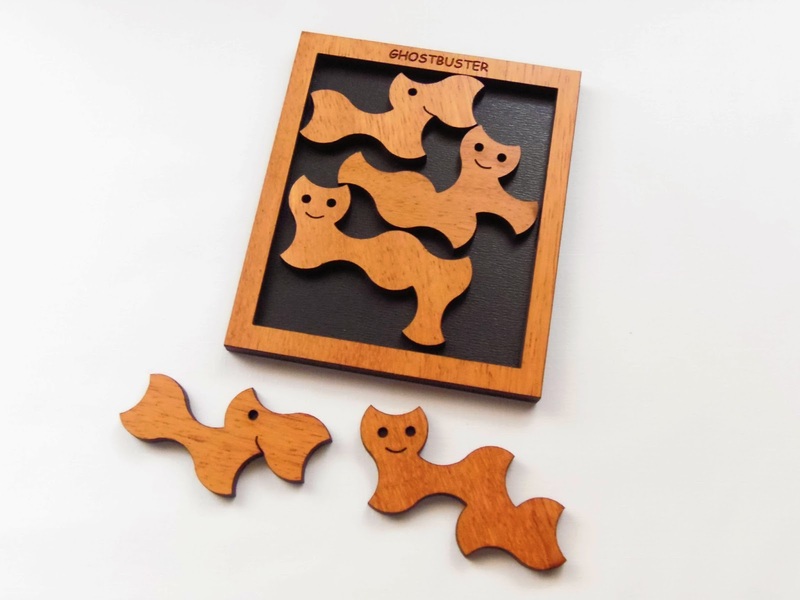 As always, PuzzleMaster has a wide variety of puzzles from Constantin - the hard thing to do is choosing. It's my first review of the year, and what better way to start than featuring a new found love, Japanese Puzzle Boxes. 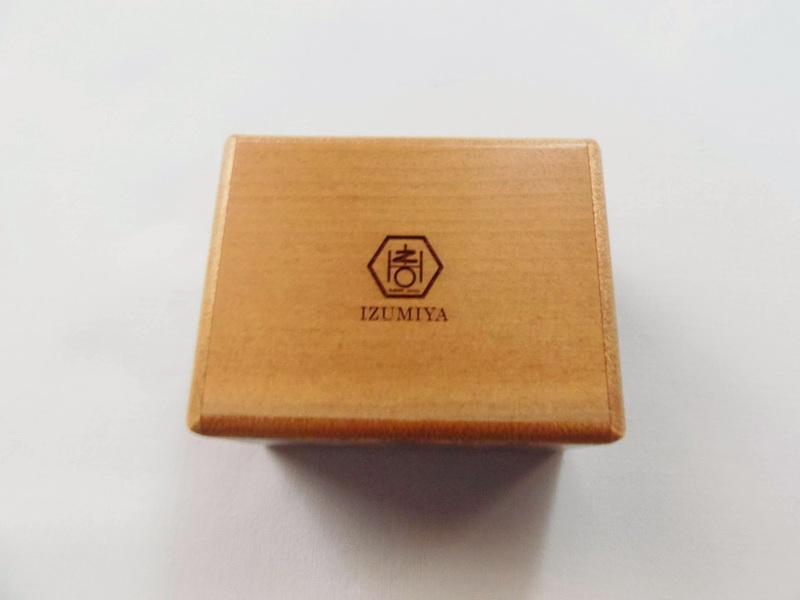 This time, I focus on a special one, a type of Japanese Puzzle Box rarely seen: what you see above is a limited edition 2 Sun 10 Steps Namiura with an engraved picture. The picture depicts one of the most famous Japanese images ever created, The Great Wave. The original name is called "Kanagawa-oki nami-ura", which can be translated as "The Great Wave off Kanagawa". The original image was actually created on a woodblock for printing, and it was published by the ukiyo-e artist Hokusai somewhere between 1830 and 1833. 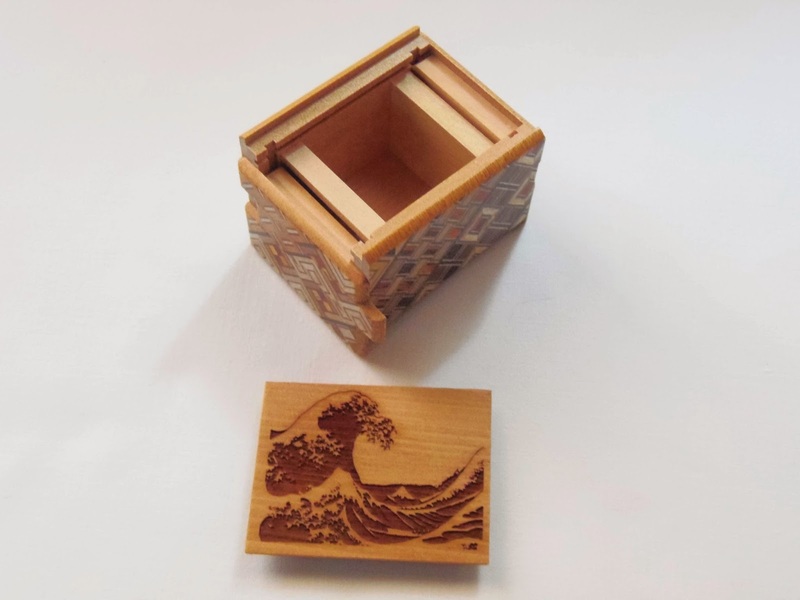 Made as a tribute to those woodblocks, this Japanese Puzzle Box is very similar to what a woodblock would look like with that image, except the box is much smaller than a woodblock. The contours of the image are engraved on top of the box, each line carefully carved on the surface. What is really impressive is the amount of detail the craftsman managed to get on such a tiny surface. On the background, you can see Mount Fuji and on the foreground, a traditional boat. 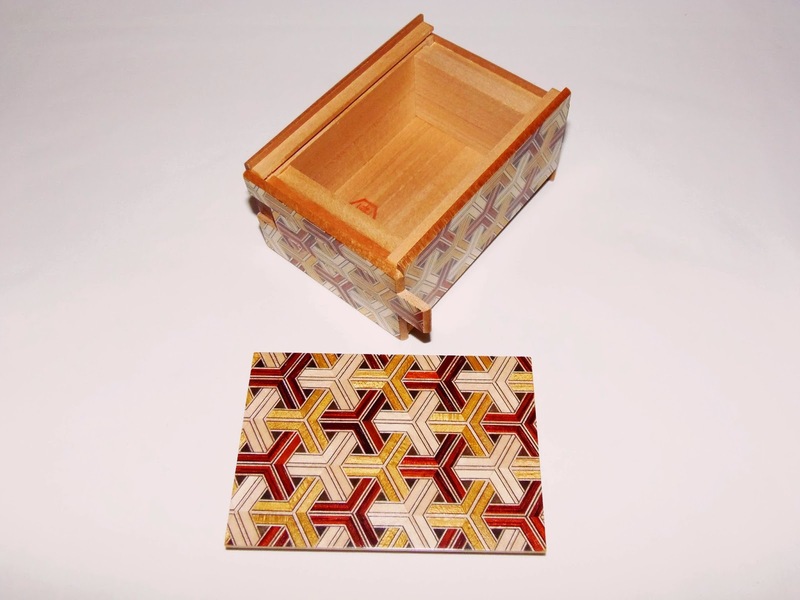 On the sides of the box, you can also see the traditional Yosegi pattern, commonly seen in most Japanese Puzzle Boxes. For reference, a 2 Sun box measures about 6cm in length (2.25"), so a steady hand is necessary to achieve such precision and perfection - a symbol of Japanese craftsmanship. 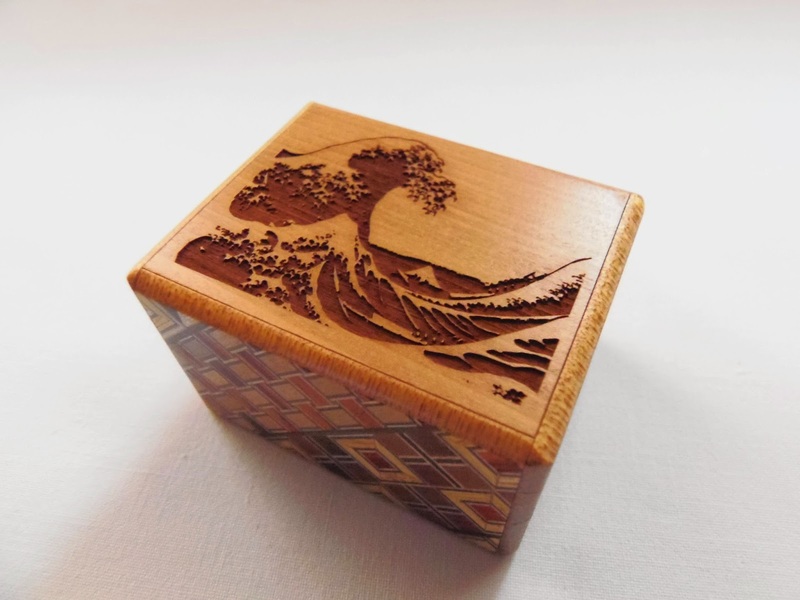 The Namiura puzzle box is made by the craftstudio IZUMIYA, situated in the Kanagawa prefecture, right where the first Japanese Puzzle Boxes were created. You can actually see the studio's stamp on the bottom of the box, so you can be sure of the high quality work of the box. 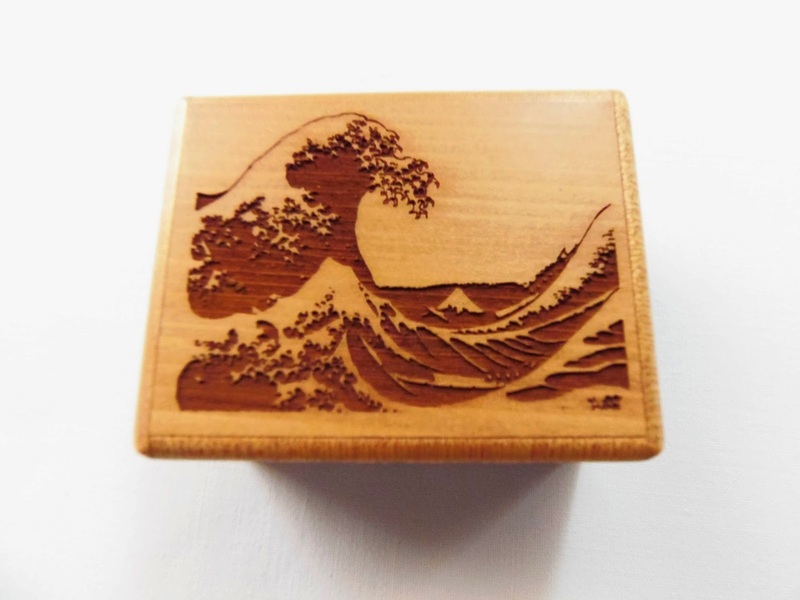 This studio also made the Hinode-Fuji puzzle box, which is currently my absolute favorite. As suggested by the name of the puzzle box, you need 10 steps to successfully open it. If you're familiar with the sliding mechanism of Japanese Puzzle Boxes, this one shouldn't be too difficult to open. Usually the sliding panels are easy to spot by the offset patterns, so it's just a matter of finding the correct sequence of movements. 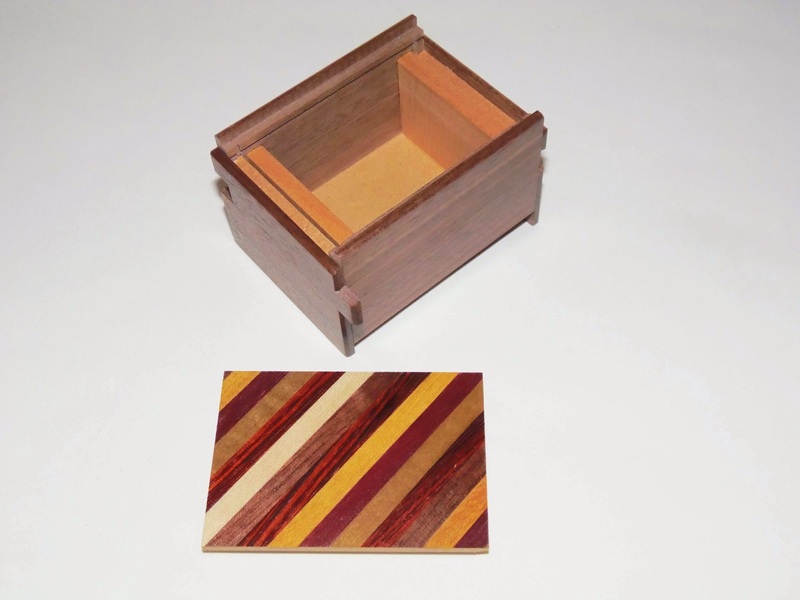 The Namiura puzzle box is a proud item on my collection and a one of a kind. You won't certainly see many of these around, so get it while you can. It's a small and easy to open box, but a truly unique and beautiful puzzle. 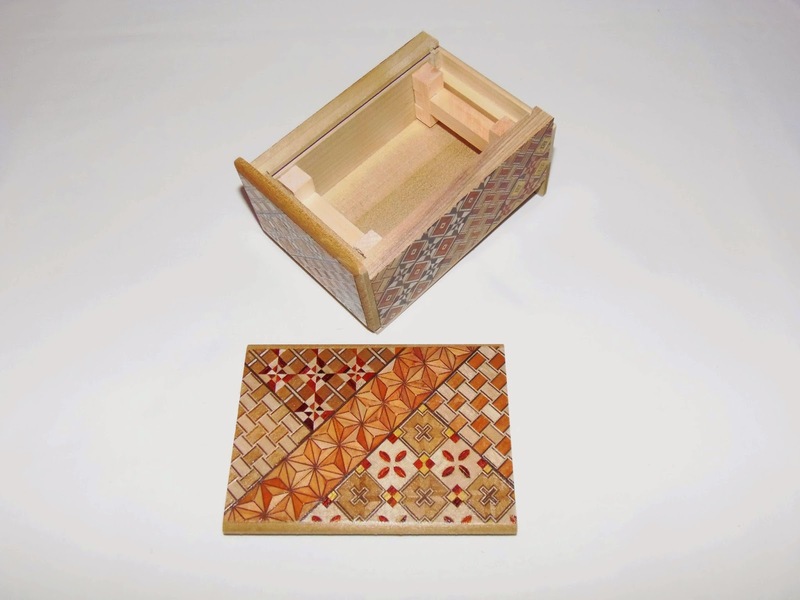 Availability: The 2 Sun 10 Steps Namiura Japanese Puzzle Box can be found at Brilliant Puzzles for $47.95 USD - A bargain, considering it's a limited edition. You can also browse other puzzle boxes here.